Repentance is often a missing element in evangelism today, but it is a prominent theme in the Bible. Following are the answers to some important questions about repentance. This study is from the One Year Discipleship Course, so if the students have already studied this, the section can be skimmed as a review. Repentance is commanded by God. It is mentioned 60 times in the New Testament. It was preached by John the Baptist (Matthew 3:1-2), by Christ (Luke 13:3), by Peter (2 Peter 3:9), and by Paul (Acts 17:30). Since the apostle Paul preached both repentance and faith, it is obvious that both are required for salvation (Acts 20:21). What are some false views of repentance? Repentance is not reformation or changing one’s life. Salvation is not of human works; works follow salvation as the effect or fruit or product (Ephesians 2:8-10). Reformation deals with one’s fellow man and with things in this life, whereas repentance deals with God and with eternal things. We must be careful not to give people the impression that they must change their lives and give up their sin in order to be saved. The life-changing part of salvation is God’s part, not man’s. Repentance is not doing penance. Many Catholic Bibles translate “repentance” as “do penance.” This involves confession to a priest, contrition, absolution (forgiveness pronounced by the priest), and satisfaction. Catholic penance is a works salvation which the Bible condemns. Repentance is not mere remorse for wrong actions. The Bible tells us that men can be remorseful about their actions without exercising genuine repentance unto salvation. This is described as “the sorrow of the world” in 2 Corinthians 7:10. There are examples of this in the Old and the New Testaments. King Saul is the prime Old Testament example. He was sorry that he got caught in various sinful acts, but he did not demonstrate true repentance (1 Sam. 15:24; 24:17; 26:21). Judas is a New Testament example of a man who was remorseful of his actions but did not repent toward God (Mat. 27:3-4). A main difference between remorse and repentance is that repentance is directed toward God (“repentance toward God,” Acts 20:21). We see this in the Prodigal Son. He was not merely remorseful of how he had lived and of the consequences he had suffered; he came to the place where he acknowledged first and foremost that he had “sinned against heaven” (Lk. 15:18). Repentance is not merely believing in Christ. Some have defined repentance as a synonym for believing. One well-known fundamental Baptist preacher defined it as “turning from unbelief to belief.” But if this is true, the Bible’s preachers would not have preached repentance in addition to faith. We have seen that Paul preached repentance toward God AND faith toward the Lord Jesus Christ (Acts 20:21). The reason why verses such as John 3:16 and Acts 16:31 don’t mention repentance is that proper saving faith includes repentance and proper repentance includes faith. Repentance and faith are sometimes spoken of in Scripture as both being necessary for salvation (i.e., Acts 20:21; Hebrews 6:1), while at other times only one or the other is said to be necessary. For example, salvation is referred to as coming to repentance with no mention of faith in the following passages: Matthew 9:13; 11:20-21; 21:32; Mark 1:4; 2:17; 6:12; Luke 15:7; 24:47; Acts 2:38; 3:19; 5:31; 11:18; 26:20; 2 Corinthians 7:10; 1 Thessalonians 1:9; 2 Timothy 2:25; and 2 Peter 3:9. Then in other passages, such as John 3:16 and Acts 16:31, salvation is referred to as believing and repentance is not mentioned. By comparing Scripture with Scripture (rather than isolating Scripture), we conclude that saving faith includes repentance. Saving faith is a repentant faith. The true meaning of faith must be explained and emphasized. The common way that “faith” or “belief” is defined by people today involves a mere mental consent to something, such as “I believe that George Washington was America’s first president” or “I believe that Jesus was the Son of God and came to die on the cross.” That is not what the Bible means by saving faith. Saving faith is a faith that issues from a heart that is convinced of its own fallen condition and has stopped making excuses and hiding in self-righteousness. Saving faith issues from a heart that is convinced that Christ is the only Lord and Saviour and that reaches out to Christ in personal trust. Saving faith issues from a surrendered heart, which is the very essence of repentance. That, and that alone, is saving “faith.” And when we are dealing with people’s souls we must be careful to explain the meaning of the terms of the gospel, as opposed to hastily running through some little “Roman’s Road” plan and then trying to get the person to pray a sinner’s prayer before he knows what he is doing. Repentance is to admit that I am a sinner before God (Romans 3:23). The gospel says that Jesus died for our sins (1 Cor. 15:3-4), so if I do not acknowledge that I am a sinner I cannot be saved. But acknowledging that I am a sinner doesn’t mean that I merely admit that “I am not perfect.” It means that I acknowledge that I am the type of sinner that God says I am, that I am not good (Romans 3:10) and that even my supposed righteousness is as filthy rags before a thrice holy God (Isaiah 64:6). Repentance means to surrender to God’s rule (Acts 20:21; Isaiah 45:22-23). Repentance is “toward God” because it is God that we have offended. He made man for Himself, and He made man to obey His laws, but we have rejected His sovereignty and lived according to our own wills. Repentance is to acknowledge that God is God, that He is the sovereign of life and that He has the right to rule my life, that He has the right to make the laws by which His creatures live, and that He has the right to punish the infraction of those laws. The Bible says the sinner is at enmity against God because of his rebellion to God’s rule (Rom. 8:7). “Enmity” means “the quality of being an enemy.” To repent means that I renounce this attitude and surrender to God’s rule over my life. We see this surrender throughout the New Testament in the lives of those who were saved. In fact, there is no example in the New Testament of an individual who was saved and who continued to live at enmity to God’s rule. Those who did this were hypocritical false Christians like Judas. Repentance means to turn around, to change directions (Acts 26:20). It is something that happens in the heart and mind. Repentance is not a change of life; it is a change of mind about God and sin that results in a change of life. Many who “believe” or “pray the sinner’s prayer” have no intention to change or to allow God to take control of their lives. They are not interested in being a disciple of Christ. They want a ticket to heaven that keeps them out of hell, but they want to continue to live as they please. They want to “believe in Jesus,” but they have no interest in obeying Him. That is not biblical salvation. The sinner must be ready to turn from his false gods, including self-worship, in order to worship and serve the true God (“ye turned to God from idols,” 1 Thessalonians 1:9). “The hand that clutches the assassin’s knife must open ‘ere it can grasp the gift its intended victim proffers; and opening that hand, though a single act, has a double aspect and purpose. Accepting the gift implies a turning from the crime the heart was bent on, and it was the gift itself that worked the change. Faith is the open hand, relatively to the gift; repentance is the same hand, relatively, not only to the gift but more especially to the dagger that is flung from it” (Stewart, Evangelism, pp. 48, 49). What are some Bible examples of repentance? The best way to understand repentance is to examine examples of it in the Bible. The Prodigal Son “came to himself” (Luke 15:17-20). This refers to conviction and spiritual enlightenment by the Holy Spirit. He humbled himself, acknowledged his sin against God and against his father, and turned around so that he was facing in a different direction. This is repentance. The evidence of his repentance is that he returned home and made things right with his father; he humbled himself and was willing to be a mere servant. Zacchaeus repented and was converted so dramatically that he became an honest man who paid back those he had cheated (Luke 19:8). The Thessalonians “turned to God from idols to serve the living and true God” (1 Thess. 1:9). That is biblical repentance. Notice that they didn’t turn from idols to God; they turned to God from idols. The order is important. If a man turns to God, he has his back to his old gods and old life. This is true repentance. It is “repentance toward God” (Acts 20:21). Unless a person rejects his false gods and false religions and self-righteousness and surrenders to Christ’s Lordship, he cannot be saved. 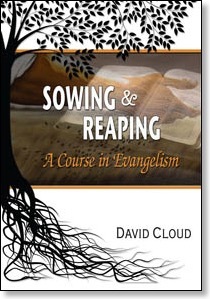 How do we use repentance in soul winning? 1. We must not skip over it; we must tell the people that God requires it and we must explain what it is. One afternoon I accompanied a pastor to knock doors in a section of his city. A few times he shared a five-minute Romans Road presentation (i.e., all have sinned against God, the wages of sin is death, Jesus died for our sin, and those who believe can be saved) and then immediately asked three questions: “Does that make sense to you?” (All of them said it made sense.) “Do you have any questions?” (None of them did, because they didn’t appear the least bit interested, not interested enough even to invite us into the home.) And, “Would you pray to receive Christ right now?” (None of them did.) Not only was the program “quick,” to say the least, the pastor didn’t even hint to the people that there would need to be a change in the direction of their life, a turning, a surrender. Many gospel tracts don’t contain a hint of repentance. This is not scriptural soul winning. If Christ and the apostles preached repentance, then we must preach repentance! We need to explain that the individual must be ready to surrender to God, and not give him the false impression that it is possible to be saved without this. Of course, we also explain that God will do the changing; repentance is not reformation or turning over a new leaf; but the sinner must be ready to accept God’s working. He must surrender. If the individual is not ready to surrender, he is not ready to be saved. I have dealt with hundreds of people who came to the place of understanding and believing that Christ died for their sins and that faith in Christ is the only way of salvation, but they simply were not ready to surrender to God. Like the rich young ruler, they refused to repent. When my wife and I first began our missionary work in South Asia in 1979, our landlord began coming to our house to have Bible studies. He was a wealthy middle-aged Hindu and had a concubine with whom he spent most of his time, though he was married and had grown children. After we went through the gospel a few times, he told me he felt that he understood what I was teaching and that he was interested in receiving Christ, but he wanted to know what he would have to do about two specific things in his life--his shady business practices and his illicit relationship with the concubine. He is the one who brought these things to my attention. I could have said, “Don’t worry about that. Just pray to receive Christ and those things will work themselves out later.” That’s the method I was taught in Bible School, but I don’t believe it would have been scriptural counsel. I don’t believe he could receive Christ and be saved unless he repented of his immorality and his dishonesty. Salvation requires surrendering. I explained to him that if he would turn to Christ, God would change his life and he would have different desires, but he didn’t want that. He was unwilling to surrender to God as God. The power to change one’s life is from God, but the sinner must surrender to God’s working. After I told him this, he never returned for a Bible study. Consider Christ’s dealings with the woman at the well in John 4. He faced her squarely with the immorality that had dominated her life. Consider Christ’s dealing with the rich young ruler. He faced the young man with his sin of self-righteousness and covetousness (Luke 18:18-23). This is the way God deals with people. He reproves men for their sin in order to bring them to repentance (John 16:8). And this is the way we must deal with men, too, if we want to follow the Bible in our gospel work. To preach repentance means to deal with glaring sins that people are holding onto and to tell them plainly that they must repent of sinning against God; they must yield their lives to Him; they must change directions; they must surrender. God will do a glorious work in their lives but they must be ready for that to happen. They must have a change of mind about God and sin that will result in a change of life. To tell sinners that God demands that they repent might cut down on the “decision” statistics, but it is the only honest and scriptural path. God has commanded that all men everywhere repent and Jesus said they can’t be saved without it, so how can we fail to tell them this? 2. We need to deal with each case individually. Preaching repentance depends on the context. We see this from the fact that the Bible sometimes mentions repentance and sometimes doesn’t in the context of evangelism. The example of the Philippian jailer. He was already under conviction when he cried out, “What must I do to be saved?” Doubtless Paul and Barnabas had been witnessing to him. We know that they had been singing and praising God. Further, the power of God displayed in the earthquake had shaken the jailer deeply. Now, through the Spirit’s working, he was ready to do whatever God told him to do. In such a case there is no need to go into a lengthy study about repentance. He was already repenting! I, too, have met men in jails and other places that were ready to be saved. They had heard the gospel and God was working in their hearts; they knew that they were sinners and were sorry for their sin against God, were tired of the old life and were ready to surrender to Him. In that context, all that is needed is to explain to the individual how to put his or her faith in Christ in a saving manner (e.g., Romans 10:8-13). The example of the idolaters at Athens. On the other hand, when Paul preached to the idolaters at Athens who were treating the gospel as merely another philosophical debate, he told them that God “now commandeth all men every where to repent” (Acts 17:30). He didn’t say, “Just believe in Jesus.” They needed to repent of their false gods, and particularly of their chief god, which was Self! They needed to be confronted with Almighty God and His claim on their lives. 1. In what verse does Paul say that he preached both repentance and faith? 2. How many times is repentance mentioned in the New Testament? 3. What preachers in the New Testament preached repentance? 4. In what verse did Jesus say except you repent you will perish? 5. In what verse did Paul say that God now commands all men to repent? 6. In what verse did Peter say that God wants all men to come to repentance? 7. What are four false views of repentance? 8. What is the "sorrow of the world"? 9. How do we know that King Saul did not repent? 10. How do we know that repentance is not a synonym for believing? 11. Why doesn’t John 3:16 mention repentance? 12. Why is repentance directed toward God? 13. In what verse did Paul demand that believers “do works meet for repentance”? 14. Repentance is a ____________________ about God and sin that _____________________. 15. Repentance means to _______ around. 16. Repentance means to change _______________. 17. Repentance means to __________________ to God's rule. 18. Repentance is not a change of ___________; it is a change of __________. 19. What are three Bible examples of repentance? 20. How do we see biblical repentance in the life of the Prodigal Son? 21. How do we see biblical repentance in the life of Zacchaeus? 22. The Thessalonians ___________ to God __________ idols. 23. Why is it necessary to preach repentance when we are soul winning? 24. If the individual is not ready to __________, he is not ready to be saved. 25. What kept my landlord in Nepal from coming to Christ? 26. How did Christ deal with the woman at the well in regard to her sin? 27. What sins did Christ point out in the life of the rich young ruler? 28. Why did Paul tell the philosophers at Athens to repent but he didn’t say that to the Philippian jailer?